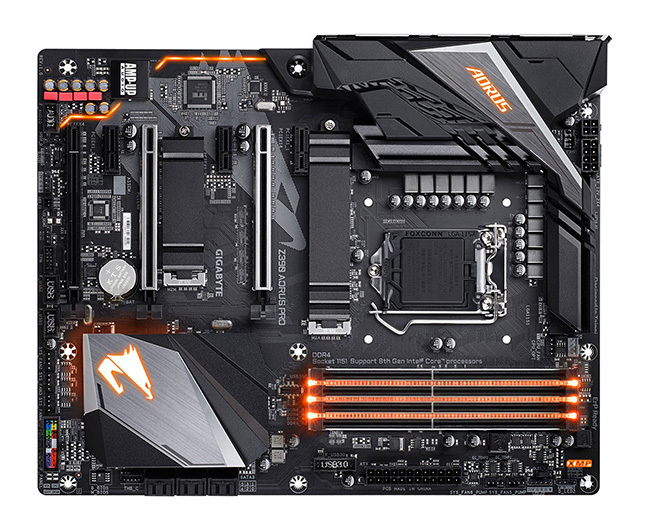 We took a look at the Aorus Z390 Master board recently. Though hitting many of the right notes, the £270 price tag felt steep, especially when boards lower down the range appeared to offer nearly as many features but at a much more amenable price point. One of those boards, cited in the conclusion, is the Z390 Pro, priced at £180 or so. Aorus invited HEXUS to take a closer look, so here we go. Also available as a WiFi model, the standard Pro pares down the cooling when compared to the Master, understandably so. This is most obvious around the covered I/O section, with the Pro eschewing the super-thick, stacked-fin heatsink for a L-shaped design that connects the top and right sections with a heatpipe inside an aluminium sandwich. The cooling is still robust, however, because there's decent TIM between the VRMs and lower part of the heatsink, while the upper section is finned for greater surface area. The heatsinks are properly screwed in and don't budge, unlike cheaper boards outfitted with plastic pushpins. Aorus has an interesting take on how to build the power-delivery system for its range of Z390 boards. The Xtreme and Master use a combination of the Infineon IR35201 VRMs and IR3599 doublers, to give total phase counts of 14 and 12, respectively. The Ultra, Pro, and Elite, meanwhile, run with six Renesas ISL69138 PWMs and six ISL6617A doublers for that same total 12 phases. You would assume the two premium boards' power delivery to be better on every front, yet that's not the case. The Renesas system has arguably better, more expensive doublers thanks to intelligent current balancing, saving potentially a handful of watts at high loads/overclocked settings because the phases work at optimum efficiency. In fact, we reckon the Z390 Pro has a truer 12-phase power design than the dearer Master. It's nice to see that Aorus provides 8+4-pin auxillary power, too. Good underlying power technology and more than adequate cooling bodes well for pushing the Core i9-9900K to 5GHz on all cores, and we'll find out just how good it is later on. We also like the fairly neutral style. RGB is in evidence in five sections - the XMP logo, DIMM slots, Aorus logo on the I/O cover and southbridge, and the thin strip on the lower-left side - but we'd probably reduce it to three. The XMP lighting looks a bit weird, and the colour underneath the DIMMs is not as good as having dedicated RGB memory equipped with diffuser bars. To that end, Aorus itself sells some nice-looking RGB RAM. There's inevitable trade-off when going cheaper, so Pro loses one of the Master's three M.2 slots and has associated heatsinks that aren't quite as chunky. That said, comparing boards directly, there is only a 2-degree difference in under-load temperature when running a WD Black NVMe 1TB drive in the smaller 2280 slot lower down the board. At this price point we'd want onboard buttons, instead of that XMP logo, and a proper debug LED. Can we also rightfully criticise a sub-£200 board for having a board-mounted Type-C connector but limiting its throughput potential to solely USB 3.0 speeds? Probably. A couple of minor style points are also immediately obvious. We don't like the red-topped audio hardware, and neither are we fans of having the third PCIe x16 mechanical slot not strengthened to match the other two. As it is, the board supports two-way SLI and three-way CrossFire, albeit with considerable lane congestion that remains a negative hallmark of Z390. What's better is the sensible fan-header provision, with five 4-pin headers, including one dedicated for an AIO, in good locations near the CPU. A further three 4-pins are available at the bottom, and the Pro has the requisite plumbing for adding two RGB LED strips. 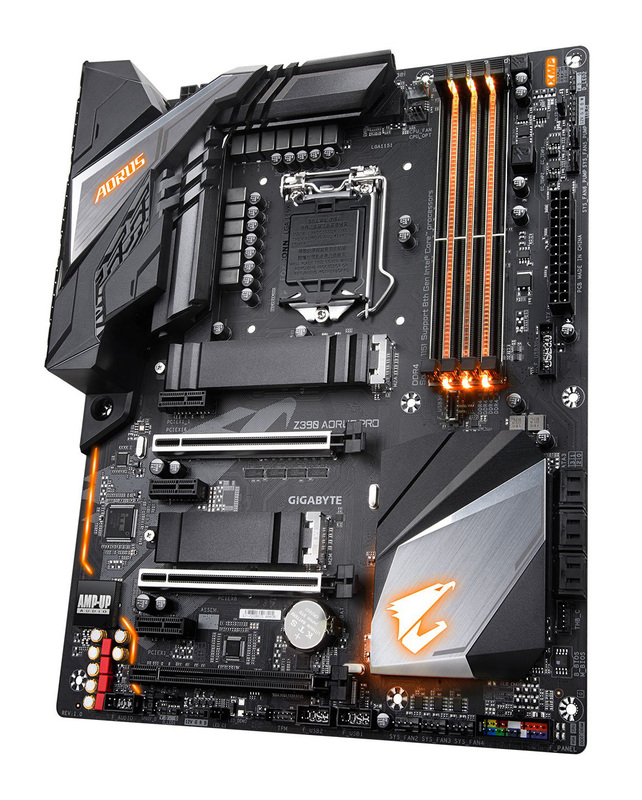 Aorus continues to adopt a decent I/O shield that's already in place. USB 3.1G2 is only found on the back, via the Type-C and red ports, and going by above, perhaps a couple of ports ought to have been shunted out of the front-panel connector instead? Having an HDMI video output is sensible, as is the use of Intel's LAN, while we never complain about the quality of the ALC1220 audio codec. What's a little surprising is that this model doesn't have the relevant I/O cutout for WiFi aerial ports of its sister board, meaning that upgrading to WiFi will require a USB adapter. It has been necessary for Aorus to remove a bunch of features and benefits in order to achieve a £180 price point. On balance, most of the cuts are fair, though a few tweaks here and there, described above, wouldn't hurt. 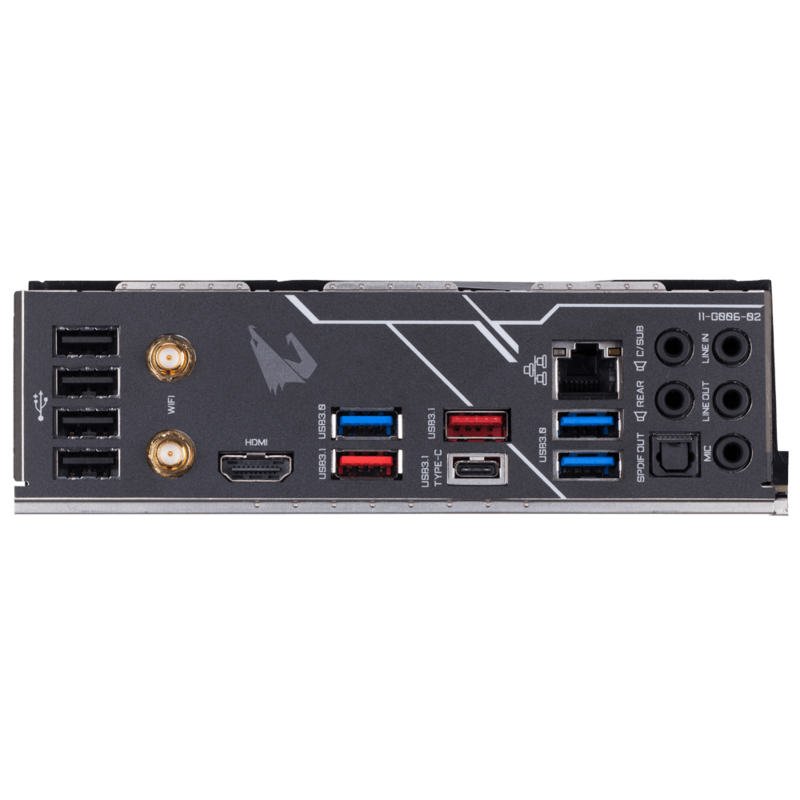 The latest firmware, F6f, apes the updated version as seen in our Z390 Master review. It represents another plus point for Aorus, particularly in relation to fan-control settings.